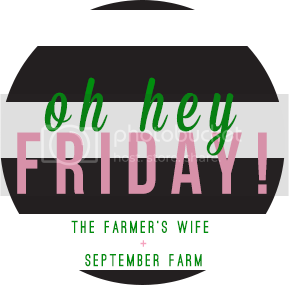 Attempting some consistency and commitment here so jumping back into the Oh Hey, Friday linkup with Karli at September FARM. So here goes and happy Friday everyone! 1. These prints from Oh So Lovely are lovely and I'm a bit obsessed with the one up top. Audrey posted them as free prints in the last week or so and I know I'm eventually going to print and frame a few, especially the one up top and maybe this one too, especially since it's Emerson. Have I ever mentioned how much I love Emerson? No? Well, I do. 2. It's Friday. People, I'm not sure I've been so happy to see Friday any time in the recent past. This week, short as it was, just about killed me. We're down people at work, so I'm picking up all kinds of extra tasks, which I don't mind doing, but oh my gosh I am exhausted. This might sound ridiculous, but have you ever had a solid week of having to manage about 6 billion things at once, make rapid fire decisions and try to keep up the appearance of being calm and collected? Well, all that thinking is just plain exhausting. Seriously, right now my brain hurts and the week isn't quite done yet. I've got about six stories to write today, plus whatever else comes up. Every day/week at work usually makes me tired with all the critical thinking, but this is a new level of scattered and tired. As I write this, with a cup of coffee in hand, I'm struggling to keep my eyes open already. Guys, it's not even 9 a.m.
3. I managed two runs this week, getting back toward my older running routine and I'm feeling good about it. Tired, but good. I'll hit the trails again this weekend, bringing me close to my goal of running every other day and then to start actually adding distance or speed. The cooler temps and lovely mornings really helped me stick with it, I mean, who wouldn't want to run when it looks like this. 4. Our road is under major construction and it's becoming more and more of an obstacle course to get to town and back every day. It's not like in town where there's about 16 different ways to get home. There is only one road to our house. There are no cut throughs to other roads anywhere near by. The state ended up not detouring, which was great for us, since that would have essentially trapped us or forced an hour long detour on a gravel road (which is super unpleasant in my little Corolla). I refuse to be one of those people that constantly whines about construction when I acknowledge that the repairs are warranted and will be nice when completed, but it is tough to never know what the traffic pattern will be like, dodge heavy equipment and drive through mud/loose gravel/construction debris on what is usually a 70 mile per hour road. Sitting at the temporary traffic light that is relocated almost every day and then having my driveway blocked by trucks (that happened yesterday) makes every day a new challenge, but so it goes. I swear I spend more time at this mobile traffic light than any light in town. 5. Maybe it's because I'm so tired or maybe I'm frustrated with the state of media these days, but I'm actually a little excited for a few of the new shows this fall. Of course, they all have strong female characters in positions of power, but I'm hoping they actually turn out to be good and offer some intelligent entertainment. I'm especially looking forward to Madame Secretary on CBS and State of Affairs on NBC. That and I'm kind over watching the bajillion seasons and spinoffs of Stargate that M has had me watching all year. It never ends folks, never! And since I forgot to mention it sooner, did you catch me over on Nina's blog? She's the sweetest, go check her out! How was your week? What are you looking forward to this fall? Remember once upon a time when I was doing Five Things on Fridays? Well, this week I came across Karli Bell's Oh Hey, Friday linkup at September Farm. Since it's basically the same thing I was doing on my own, I decided to give it a whirl. 1. The ice is going in at the rink! WAHOO! If I understand right, it's the earliest we've ever started the season and even though it's more work, it's really fun to be involved. I spent 5ish hours at the rink Tuesday night helping paint the ice and ended up with a face full of ice paint, which is really just chalk, but it was a lot of fun. I was back last night just to take some photos since I run the rink's Facebook page and am building the new website. It's going to be a busy season, but hopefully a great one! 2. Changes in journalism are still coming, but there are aspects of it that I'm actually excited about it. We'll see how things shake out, but I'm feeling much, much better than I was a week ago about the entire situation. 3. We're headed to Kalispell/Whitefish tonight for the airshow this weekend. So excited to meet up with some of our friends out there, get back to the Kalispell Brewing Company, check out the ice rink there and you know, hang out with a fighter pilot (who I will be interviewing again). Hopefully the weather will be stunning like it has been the last few days and it will be a good weekend of fun. 4. I got invited to an invite only military reporting conference in D.C. the few days before the conference hosted by the military reporting association that I serve on the board for. So that was great news this week and gives me more days of professional development training with my military reporter colleagues from around the country. Because I'm a total nerd, I'm really excited about it. 5. This chickens have stopped laying eggs. I guess because of the days getting shorter, or the season starting to change or I don't know. According to a Google search, it sounds pretty normal, but no eggs for the last two weeks. They should start laying again in the near future though. In the meantime, my tomato plants are exploding and I am looking forward to lots and lots of salsa making! And just for fun since it was #NationalDogDay and I miss the pups who are at daycare for the long weekend while we're out of town, here's Grover-pup, making a pillow out of my stack of books. More to come later this week, I'm slowly catching up on all things blog and there's lot going on over here at the minifarm! Happy Friday everyone! Initially, I'd planned to post something else today, but a series of things let me astray. Last night I had dinner with a lovely couple. I met the wife through social media and you met her on the blog last year. We finally met for the first time in real life last night. I drove home feeling ecstatic that I had new real life friends in Montana who are awesome people. Today, I'm speaking with two co-workers to a college class about women in leadership. When my co-workers asked me to join them, one said I should talk about how I got my job. There are plenty of ways social media is ruining us. We spend our time chained to our devices, or caught up in the lives of people we don't even know, or suffering through comparing ourselves to others. But I've met many wonderful people through social media who have become good friends in real life. There are some I haven't met in real life, but have brought perspective and meaningful conversation to my online life. And you guys, I didn't look at my phone in the whole two hours that I chatted away with Jessica and her husband over Mexican food and margaritas the size of your head. Not once. Some of my best journalism mentors turned friends started through Twitter interactions. And I've found friends from a study abroad semester, years later, on Twitter. Later this month, I'll be running the Shamrock Shuffle 8K with Alicia and Eileen. It will be the first time we meet in real life and I'm looking forward to the run, the fun and friendship. Perhaps social media is ruining us and causing us to think in 140 characters or Instagram photos, but I think it's still capable of connecting us in ways we couldn't before. And now, for Five Things. 1. Catching up on a million and one things. 2. Cleaning and getting the house together for our first out of town visitor. 3. Connecting people and organizations through work and the rink event I'm frantically pulling together. 4. Cooking breakfast for the first time in ages. M is usually the one to do the cooking, but honestly, I've missed it a bit. 5. Sunny skies, warmer temps and a break from winter. Though it will likely be short lived. Have you met any online friends in real life? February is halfway gone and I'm still not caught up on everything from January. Clearly, I'm no expert on being superwoman and doing all.the.things. Without fail, as I catch up and get things done, I discover at least 10 more things I want to see, do, read, think, go. A few weeks ago, I was feeling particularly overwhelmed and exhausted. The lovely Alicia was in a similar spot and had some wise words for banishing overwhelm. Erika is one smart cookie and suggested thinking smaller to make big changes. As the new year was approaching, I was excited for all the big things we had planned. Then January happened and everything was a struggle. For the last few weeks, I've been thinking a lot about how to get a handle on everything and beat this ridiculous feeling that I'm adrift with no anchor or real direction. What I've come up with is what I call The Truths I Know in Theory but Still Struggle to Execute. + Find Your Passions. There are loads of things that I have at least some interest in. My challenge is to focus the majority of my energies on the things I care most about. Take some time too think about the things you're most passionate about and direct as much time and energy accordingly. + Prioritize. There will always be infinite demands on your time and it's up to you to make the most of that time. A friend once said to me, when I was feeling overwhelmed, "Is it a today problem?" When I said no, she said, "Then it's a tomorrow problem. Handle the today problems first." I have used that system ever since to limit worrying about the things that don't really need to be done right away. + Say No. I have a habit of always saying "Sure, I can help with that." When in reality, I don't have time. I'm slowly getting better at knowing when I am maxed out or when I have some time to pick up other quick, small tasks. I'm also getting more selective about social activities. Sometimes sleep, errands, house projects or just quiet time at home are more important being the social butterfly all the time. The key is to not let little tasks, or things you don't really want to do, crowd out your passions. + Quiet Time. The mind needs quiet time to settle and actually think. Life is busy and frantic and overloaded with technology. Make time to sit quietly, go for a walk/run, road trip or write in your favorite spot. + Break Things Down. Along with prioritizing, break big projects into smaller tasks. I like to make list upon list of projects that have titles like "start nonprofit" or "chicken plans" or "garden" and then list out the smaller details that go into that big project. It helps accomplish the necessary tasks without the overwhelm of the big end goal. + Organize. Straighten your desk, streamline the to-do list Post-It notes, enter contact info into your contacts and toss the random scraps of paper all over your desk and file away what you don't need now. Clear the clutter. Sometimes I go on cleaning streaks when I feel like I'm drowning in to-dos just because an uncluttered space helps unclutter my mind. + Take Action. Now that you've got your passions, your priorities, your breakdown list and your clean and organized desk, get to conquering those mountains and big dreams. You've got the plan, go make it all happen! I also have my happy place. Something on my desk that makes me smile. A photo, a book, a note, a stuffed animal, some token from a friend. But usually, it's this photo snapped by littlest sister one Christmas. Because with a face like that to come home to, you can't help but be happy, here's Five Things I love about the last week. 1. Rink Event. The board approved my idea and I am now an unstoppable force of making it happen. So much to do, so little time, but it's going to be amazing. 2. Stopped at the library and already finished Dan Brown's latest, Inferno. Had to get it in large print and the huge type may have given me headaches, but feels good to breeze through a book, especially one I'd been wanting to read. 3. Got out for a run. Finally. The winter weather let up long enough to crank out three miles and my iPod was charged and ready to go this time. 4. Sit spins. A few months ago, they were impossible for me to do. Now, a ton of squats later, plus ice time and sheer force of will, they're coming back, with less chance of face planting than the camel spin. 5. Good news. After a hard January, it's soul-lifting to have so much good news coming. There's a baby on the way and an engagement in the family (not me, everyone calm down). So much is going right, it feels like the tide is changing and I'll take it. How do you handle the overwhelm and move the mountains you want to move? What are you happy about from the last week? There are things I'm not good at doing. Like drawing and math. And I absolutely cannot whistle. But honestly, those aren't things I'm interested in doing so it works out. For the things I do want, I sometimes struggle with a self imposed notion of "can't." Once that notion is my head, it's hard to shake. Enter what I call my sheer force of will or mind over matter mode. My mom could tell you that there are plenty of things I have pulled off simply because I decided to. During morning ice last week, I managed to clear my mind of can't. For a few weeks, I kept chickening out of my favorite jump and feeling this wildly intense and somewhat irrational fear of the jump. I'd done it plenty of times and I know I can do it, but all of a sudden, fear was winning out agin. I've also wiped out plenty of times. Enough to know it hurts, but probably won't kill me. The trick is to say to yourself "I am going to do this" instead of "don't fall." All your mind hears is "fall" and just about every time, you'll fall or botch the landing or not jump at all. Jumping around on ice isn't the day to day challenge for everyone, but the takeaway is the same. The self satisfaction of landing the jump was huge, but the bigger satisfaction came from taking back control of my thoughts. Some of that comes from pushing your body just a little bit harder and feeling pretty proud of what your little legs can do on ice. It's a similar feeling that comes after running a half marathon, or a race longer than three miles. But in skating, I don't have to run so far, for so long. And the trick works for other challenges too. A difficult work project, tackling a massive to-do list, driving on icy/snow roads in -20 temps. Of course there are times that safety is a real factor and I don't recommend clearing your mind of can't when it's truly reckless and dangerous. For example, "I can't pet a bear." No. You really can't. Or at least shouldn't. Since it's somehow already Monday again, here's the latest edition of Five Things. 1. Finally got my Great Falls library card. Kind of stoked about it. 2. Scheduled chicken pick-up. Having a hard and fast deadline always helps me get things done and I'm excited to have the fluffy chicks around the homestead. 3. Emailing the reporter who took over your old job and her responding to say she knows exactly you who are because you have such a great reputation around town, still, four years after you left the state. That's an incredibly good feeling. 4. A general came to town who was at the base where I was said reporter. He was there six or seven years ago and wasn't a general then, but he remembered me. Kind of cool. 5. Pitching the rink event idea to people outside skating circles and they get excited about it and volunteer to help. More to do this week, but I'm feeling good about it! What are you excited about this week? Are there any situations where you can clear your mind of can't?